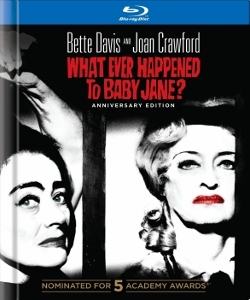 Article first published as Blu-ray Review: Whatever Happened to Baby Jane? [50th Anniversary Digibook Edition] on Blogcritics. 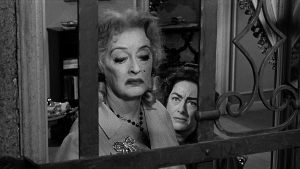 The acclaimed psychological thriller Whatever Happened to Baby Jane? pits Bette Davis and Joan Crawford in the ultimate game of sibling rivalry. The 1962 film, now available on Blu-ray, is sometimes considered a horror film, but that category doesn’t quite fit. The film is full of horrors, but not the kind that typically make up the genre. It’s a horror of the mind and spirit that dominates this film. This is the horror of a life gone wrong, of misunderstandings, and of an unresolved past. Whatever Happened to Baby Jane? is scary because it feels so real, like it could happen to almost anyone. It could even be happening in the house right next door. Davis and Crawford play the Hudson sisters, Jane and Blanche. When Jane was a child she was known as “Baby Jane.” She tapped dance and sang cutesy songs like “I Wrote My Daddy a Letter” while her real daddy accompanied her on the piano. Baby Jane was adored by her throngs of fans and, of course, by her daddy. Neither Jane nor her father cared very much for Blanche. Jane was spoiled and Blanche was forgotten. As the sisters grew into adulthood, things changed. Blanche became a famous and beloved actress, while Jane’s schlocky films were the laughing stock of Hollywood. At some point during the height of her success, Blanche is partially paralyzed in a freak automobile accident. It’s assumed the drunken Jane was responsible, though she is never punished for the crime. Years later the aging sisters share a large Hollywood home, living off of Blanche’s royalty checks. The disabled Blanche is confined to her upstairs bedroom and the hallway at the top of the stairs. Her only contact with the outside world is via her phone and her housekeeper, Elvira (Maidie Norman). Jane is clearly unstable. She’s an alcoholic who can’t get over her lost fame. She wears garish makeup and frilly dresses much like she wore on stage as a child. Bette Davis steals the show. Crawford does a nice job as the victimized Blanche, but Davis takes the role of Jane and runs with it. Her fearless performance makes the character unforgettable. 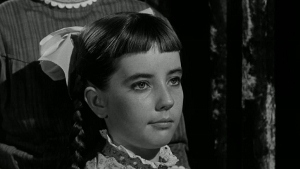 With each passing scene, Jane’s madness deepens and the horror she inflicts on her sister becomes more frightening. What begins as verbal taunts turns to mental torment and physical abuse. The desperate-for-fame Jane harbors dreams of resurrecting her career. She even hires a pianist (Victor Buono) to play her old songs. Her aged performance of “I Wrote a Letter to Daddy” is both difficult to watch and mesmerizing at the same time. To see someone so pathetic, yet so unaware of their own self, is fascinating. As interesting as it is, I wish we knew more about the characters. We see only a brief bit of their past, and then we see them as they are in old age. We do not see the transition. Jane is obsessed with her dad, but we don’t know much about their relationship. We also don’t know anything about Blanche’s relationship with her parents. Her mother had told her as a child that she would one day be in the limelight, but we don’t get to see the fall of Jane or the rise of Blanche. We just know that it happened. Because of this I felt that the twist at the end of the film failed to have the punch it should have. For me the ending didn’t change the way I felt about any of the events that happened in the film. Despite feeling the movie is a little overlong, and being a little disappointed in the ending, I can’t take anything away from Bette Davis’ performance. She truly shines in the role. I did like the way the horror built as the film went along. 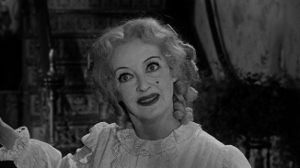 Overall, I think Baby Jane is ultimately worth watching if only for Davis. The Blu-ray is presented as an AVC-encoded, 1080p transfer in a 1.78:1 aspect ratio. The black & white cinematography looks excellent. The detail is always sharp, and even the dimly lit sequences are easy to see. Even without color, Davis’ garish makeup and frilly, poofy dresses come across vividly. The sound is presented in a DTS-HD MA Mono 1.0 mix. The dialogue is always clear and easy to understand, even when Jane is screeching. Background noises are not that apparent, but it’s a quite movie to begin with. The fidelity overall is very good. The Blu-ray offers quite a few special features, including a commentary by drag queens Charles Busch and John Epperson, several featurettes, and a clip of Davis appearing on The Andy Williams Show. The most substantial of the featurettes is “All About Bette,” a Turner Classic Movies special about the actress. There’s also a 30-minute overview on Crawford as well as a 30-minute featurette covering both actresses. The six-minute featurette “Behind the Scenes with Baby Jane” is a vintage promotional piece showing some brief glimpses about the making of the film. Overall it’s a nice package for anyone who is a fan of either actress, though there is not much specifically about the film itself. The 40-page hardcover book that serves as the Blu-ray case contains many still photos and information about the film. I love this film. It was one of the most stunning psychological films I’ve ever seen. The rat on the dinner table must be seen to believed. It was a turning point for the so-called ‘Bette & Joan’ feud on-screen, as well as off.